In large bowl, beat cream cheese, wing sauce and milk with electric mixer on low speed until well blended. 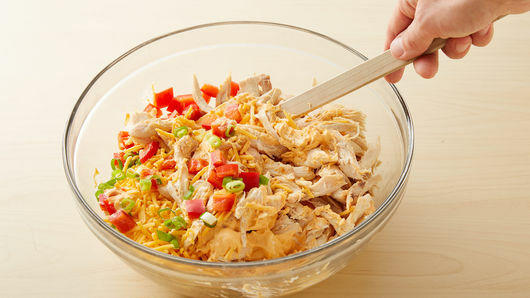 Stir in chicken, bell pepper, 1/4 cup of the green onions and 1 1/2 cups of the Cheddar cheese until well blended. Spoon evenly into casserole. Separate dough into 8 biscuits; cut each into quarters. Place biscuit pieces on top of cream cheese mixture. Bake 30 to 35 minutes or until golden brown and bubbly. Sprinkle with remaining 1/2 cup Cheddar cheese. Bake 10 to 15 minutes or until cheese is melted and biscuits are no longer doughy. Sprinkle with remaining 1/4 cup sliced green onions. For added flavor, sprinkle with crumbled bleu cheese just before serving. 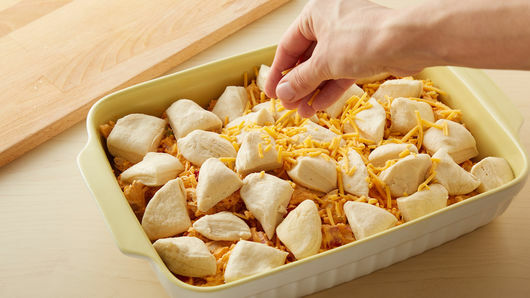 This Buffalo Chicken Casserole would make a great appetizer. Just use the biscuit pieces for dipping. If you’re a big fan of Buffalo chicken appetizers, then get ready for your dreams to come true. 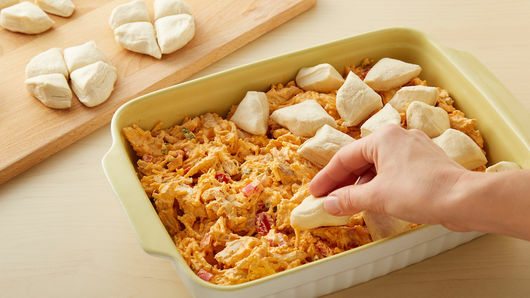 You can have Buffalo chicken for dinner now thanks to this buffalo chicken casserole. This 13x9-inch pan of goodness makes 8 servings. Feel free to pair it with fresh cut celery and carrots to cut through the spice. For a gluten-free option, we’ve got you covered. 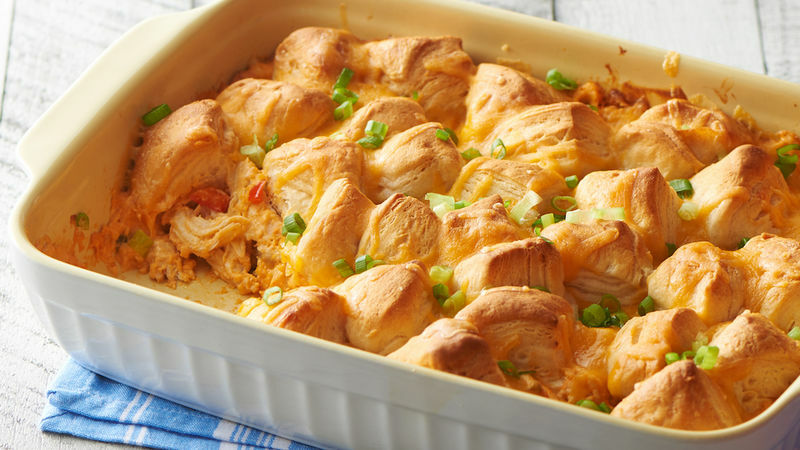 Or, if you want a bit more dough in your life, this crowd-pleasing Buffalo Chicken Crescent Ring needs to make the guest list for your next party. Branch out from casseroles and plan your next dinner using our list of easy chicken recipes.